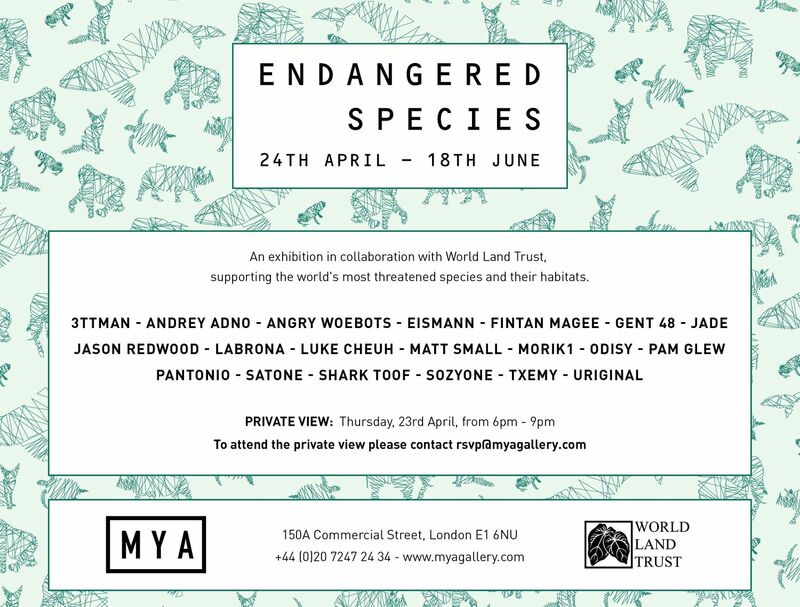 This month, MYA Gallery is teaming up with World Land Trust to bring you Endangered Species, a collective exhibition showcasing 20 hand-selected international contemporary artists, each challenged to depict one animal under threat of extinction. With nearly a quarter of all species of mammal, and a third of amphibians, threatened with extinction, there’s an urgent need to safeguard wildlife and their habitats. Tackling the critical threat of climate change, promoting sustainable use of resources and continuing to challenge cultural traditions of hunting are just some of the ways to help cultivate a world where people and wildlife thrive side by side. This exhibition aims to consider the collective factors behind these animals’ dwindling numbers and the ways in which we can support those that are working towards protecting them. World Land Trust (WLT) is an international conservation charity, which protects the world’s most biologically important and threatened habitats acre by acre. Since its foundation in 1989, WLT has funded partner organisations around the world to create reserves, and give permanent protection to habitats and wildlife. Its missions are to protect and sustainably manage natural ecosystems, develop partnerships with local individuals, communities and organisations whilst raising global awareness for the cause. By applying the latest in cutting edge scientific practices and working closely with local communities, conservationists are striving to create enduring solutions that maintain the fragile synergy of life on our planet. Alongside the exhibition, MYA Gallery will showcase a collection of photographs provided by WLT, as well as information on current endangered species and the shocking figures of their declining numbers. This photographic journey will help document the eects that hunting and environmental changes can have on species at risk as well as the projects WLT is involved in internationally to help rebuild their populations. Each one of the 20 exhibiting artists has chosen one specific animal at threat to be the subject of their original artwork. UK born Pam Glew has selected to work with the subject of the Puma, SatOne from Germany the Monarch Butterfly, USA based illustrator Luke Chueh the Killer Whale, while Australian artist Fintan Magee will focus on the Southern Cassowary to create a truly internationally diverse collection. The exhibition aims to oer visitors an educational experience about the animals at threat, whilst highlighting the positive steps that are now being taken by WLT and others to save them from extinction. 10 per cent of the proceeds of each artwork sold will be donated to World Land Trust to help them to continue their work to conserve and preserve this beautiful, vulnerable and utterly unique planet we all call home. MYA Gallery will also celebrate its first birthday on the exhibition’s opening night of the 23rd with the release of its new magazine, MYA Review, so be sure to join us to reserve your copy of its limited and exclusive print run.